I wrote a detailed article on minimum flow for the Pumps & Systems November 2015 issue (read it here). That article focused more on calculating the actual minimum flow boundaries than discussing the allowable and/or preferred operating regions and the resulting effects on pump reliability. Since then, the subject of allowable minimum flow limits for pumps and the consequential system reliability has surfaced on a regular basis in my work with owners and operators across the world. I constantly witness pump operators making poor decisions based on erroneous and/or partial data. I frequently witness end users operating pumps at or near the shutoff point with little concern for the pump reliability and mechanical seal life. However, in a recent case the customer was looking at a pump reliability chart and interpreted the data from the opposite perspective, thinking they could only operate at best efficiency point (BEP). The subject chart created from a generic approach captured the prevailing pump issues that will occur when operating at points away from BEP. I will state that the chart is a good example to educate end users on the issues associated with operating away from BEP. A similar chart is shown as Figure 1. This chart is a great visual tool from a collective and generic prospective, but it does not differentiate for specifics such as pump size/geometry, shaft defection ratios, net positive suction head (NPSH) margin, specific speed (NS), operating speed, brake horsepower (bhp), operating temperature, fluid properties and suction energy (SE). The customer was rightfully concerned that they are operating at a point away from BEP, but not too close to the minimum flow boundary. This month, I intend to use a small American National Standards Institute (ANSI) pump as an example to illustrate that most centrifugal pumps can offer satisfactory service when operated away from the design point, as long as the owner realizes there are caveats and boundaries. My opinion is that a standard ANSI pump from a reputable manufacturer if selected, installed, maintained and operated correctly, will offer at least 20 years of satisfactory service based on industry average duty cycles, fluid properties and typical applications. While I have seen many ANSI pumps celebrate their 40th birthday in full service and still going strong, I have also seen pumps destroyed in minutes. Customers’ actual results will vary significantly based on a long list of parameters that affect the life and reliability of the pump that the end user controls in situ. All commercial and industrial centrifugal pumps are designed for one set of hydraulic conditions of head and flow, known as BEP. Other operating conditions of head and flow are a financial compromise. 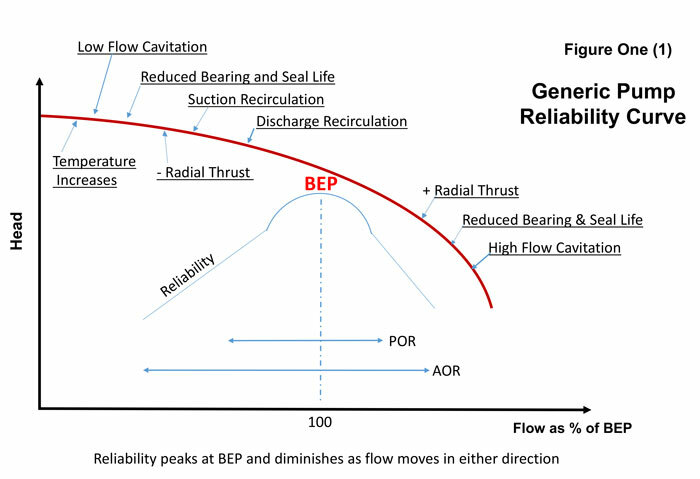 At BEP, the pump will be at the most hydraulically efficient operating point, at the lowest disc friction and shock losses point, at the quietest point, at the minimum vibration point and at the least radial thrust point. When determining minimum acceptable flow for a given pump there are several considerations. The first two are thermal limits and mechanical limits. How to calculate and assess these boundaries is covered in my earlier article from November 2015. The main point of this current article is to discuss the operating range between BEP and minimum continuous stable flow (MCSF). MCSF is the minimum flow that must be maintained through a pump to avoid excessive recirculation at the impeller inlet. Hydraulic Institute (HI)/ANSI B73.1 overall operating parameter specifications and subsequent manufacturing designs are more liberal for the ANSI B73.1 pumps in general than American Petroleum Institute (API) 610 pumps as a comparison. The difference is mostly due to the amount of energy involved for typical applications (measured predominantly as horsepower [hp] or kilowatts [kW], but not totally). Additionally, there is an API 610 specification parameter that mandates a minimum 3-year continuous operation no matter the operating conditions. API pumps are comparatively in an advanced league. Applications for API 610 pumps include a significantly wider hydraulic range, higher temperatures and higher pressures than required in the ANSI B73.1 applications. An API 610 compliant pump is always going to be markedly more expensive than an ANSI pump of similar size; it is therefore prudent to protect the investment. API pumps are typically in processes that have little to zero tolerance for unscheduled shutdowns due to the extremely high cost. For the particular example in this article: the ANSI B73.1 minimum flow specifications for the pump in question (ANSI - AA) (1 x 1.5 – 6) call for a minimum continuous flow of 15 gallons per minute (gpm) based on operating with the maximum impeller diameter. The impeller in this case was trimmed to 4.25 inches, which is approximately 75 percent of the maximum diameter; consequently minimum flow for this application can be as low as 12 gpm. The end user operates the pump at 30 gpm.